There was something about a train timetable, memories and a cake. I recall slow progress, and frequent reference to the Collins Robert Dictionary. 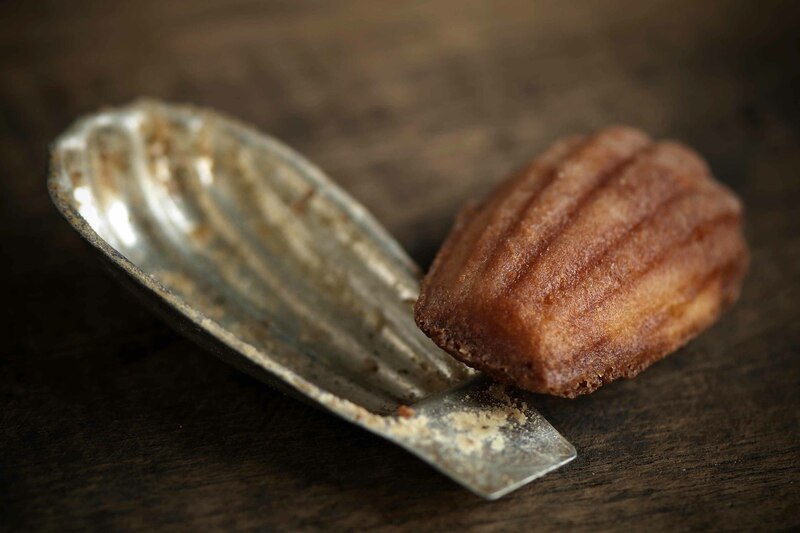 I wonder when it became impossible to mention a madeleine without also referring to Proust. My first madeleine was from a station vending machine on a Sunday in France where there are no other options. Tempted only by their value for money I ate twice as many grams per franc as a friend choosing Milka. The shell-shaped snack sat among 5 others on a clear plastic tray, in a stiff and colourful plastic wrap; a lamentably dense, cold, cakey mono-texture. I imagine witty railway employees providing these in retribution for school days of arduous prose from heptology À la recherche du temps perdu. I understand; I managed just a third of Volume 1. In contrast, the real thing is truly wonderful. A crisp outside, a light and airy centre, and flavoured with a delicate touch of honey or lemon. Recipes differ, I believe Robuchon is best. With a morning coffee they will vanish in a trice. I should give Proust another try, perhaps this time in English. These are equally good made in muffin tins. 1. Wipe out madeleine moulds with a fine film of melted butter. 2. Melt the 200g of butter in a pan, add the honey, and put aside to cool. 4. Beat the egg whites until slightly foamy, and whisk in the flour-sugar-almond mixture. Stir in the melted butter and honey, whisking until it forms a batter. 5. Spoon into madeleine moulds until they are 2/3 full. Refrigerate for one hour to firm up before baking. 7. For an 8cm madeleine, bake for 12-15 mins. Adjust times depending on size of madeleine – keep checking as they can brown very quickly. They should be lightly golden and firm to the touch. 8. Tip madeleines onto a cooling rack, and hide them from others. When made with a milder honey, they are wonderful with a sprinkling of orange blossom water, rosewater, a little melted dark chocolate, or lemon zest and juice. Mix any of these to the batter along with the melted butter. For me, they are best eaten fresh from the oven, with the Sunday papers and a coffee. Preferably while others sleep. NOTE: There is excessive debate between metal and rubber moulds. The rubber moulds colour the madeleines less evenly (you get a darker patch where the madeleine touches the baking tray – see above), but they don’t need greasing and never stick. My vintage Czechoslovakian moulds are a chore. Sadly I own nothing in between. I did French at uni and never managed to get even a third of the way through À la recherche du temps perdu. I never could understand how it was so widely lauded. Yes the man was good at describing things but good god almighty, it was interminable and so boring! Your madeleines look delicious, and thank you for your comment on my Russian dumplings. I’d hazard a guess they’d be close to the Polish pierogi?! Cheers! I didn’t really study French which made it even more of a chore…. However, I still think of it when flicking through railway timetables, and imagine perhaps I should have tried harder! Your comment all makes sense to me now, did I say your madeleines are beautiful ? Sighs….. I love madeleins and the simplicity of this baked good. And your top photo is simply beautiful as well.